Canadians cherish their healthcare system. It has become part of our national fabric; one of the defining characteristics of our country. We value the principle that our access to health care depends fundamentally on need rather than on the ability to pay. Our national heroes include the founders of our modern system, like Tommy Douglas. For all its successes, however, our health care system also has its significant flaws. Chief among them is our persistent problem with wait times. According to The Commonwealth Fund – a respected think tank in the US – Canada persistently ranks dead last in wait time performance when compared to 10 peer countries. How is it that our cherished system has come to be ranked dead last in wait time performance? Nearly every Canadian family has a wait-time story. We wait in emergency departments. We wait to see family physicians. We wait for tests, procedures and surgeries. We wait to see specialists. We even wait to get out of hospital — an increasing number of Canadian seniors find themselves in acute care hospital beds not because they are sick, but because they cannot live independently and have nowhere else to go. Are long wait times simply the price we have to pay in order to uphold our Canadian values of equity and fairness? The answer to this question is a resounding, “No”. In fact, there is good evidence that Canadians’ wait time experience is not equitable at all. How long you wait for medical care depends a great deal on your postal code. Even within provinces, the Wait Time Alliance (WTA) found that there are considerable disparities in wait times and access to care in general depending on where you live. There are many reasons why Canada’s medical wait times have stretched to unacceptable levels. One is siloism. Our federated model has created provincial and territorial silos, and our attempts at integration and reform have largely fallen flat. Monique Bégin famously said that we are a country of perpetual pilot projects, lamenting our inability to scale-up and spread new ways of doing things. Another is the fact that the health care landscape is increasingly one of chronic disease. In the 1960s, the health care system was designed to care for people who develop acute illness. Today, however, we typically see patients with multiple chronic diseases who need access to care across the entire spectrum, from primary care through to hospital and restorative care and finally to long term and palliative care. The typical patient experience is no longer just an episode of care, it is a trajectory of care that spans time, caregivers, and venues. And these trajectories are peppered with multiple transitions that tend to be poorly managed. It is at the transition points where mistakes are made, inefficiencies are generated, and suboptimal outcomes are born. And the third is that we don’t manage the wait time experience for people very well at all. Any Canadian can walk into a large hardware store and a sales associate can quickly (and electronically) locate any item they want, but that same Canadian cannot find out quickly and easily where they are on a surgical wait list. They can book their car for service online with a few clicks but most cannot electronically book appointments with their family physician. Canadian patients cannot easily compare centres or providers to see where care can be provided fastest. And caregivers and hospitals too often do not have access to real time wait time data to manage patient flow and resources efficiently and equitably. Information technology (IT) can facilitate many of the solutions to our chronic wait time problem, as its use in other sectors has shown. Seemingly simple solutions, like common wait lists – first shown to reduce waits in bank lines and at Wal-Mart – are easily implemented with the aid of IT. The healthcare sector lags behind other industries in the adoption of IT solutions, making IT truly the low hanging fruit that can pay large efficiency and performance dividends if we can catch up with other industry sectors. Novari Health is solely focused on IT solutions that improve patient access to care. Importantly, we recognize that health is a journey for patients, not just an episode of care. Our software modules reflect our understanding of this journey, with solutions ranging from virtual primary care through to e-referral and e-consult, to surgical booking/wait list management and provider relationship management. Canada won’t fix its wait time problem overnight. It will take new political and policy work, targeted investments, and patient flow innovation. But as the old saying goes; we can’t fix what we don’t measure. IT solutions that provide real time data coupled with providers and organizations who are dedicated to improving the health care experience for patients and their families can produce real, lasting improvements. Our goal should be nothing less than the restoration of the health care system to one that is truly worthy of Canadians’ confidence and trust. Dr. Simpson is recognized nationally and internationally for his clinical work and healthcare policy leadership. 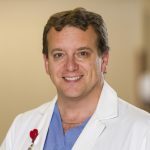 He is the Chief Medical Information Officer at Novari Health, a practicing cardiac electrophysiology at Kingston Health Sciences Centre, the Vice Dean (Clinical) of the Faculty of Health Sciences at Queen’s University, as well as the Medical Director of the Southeastern Ontario Academic Medical Organization (SEAMO). 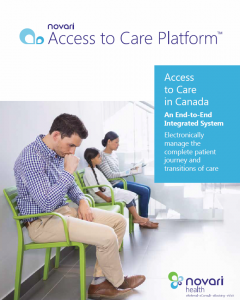 Learn how the Novari Access to Care Platform can help improve wait times.